Komo Kitty℠ services by Pooki’s Mahi® enables Founder/CEO Leslie Magsalay-Zeller to design and launch custom Matcha Matcha Man® tea capsules, Pooki’s Mahi will fulfill 100% Kona coffee pods and Kafpresso™ luxe coffee capsules for several foodservice customers with 5000+ locations. I'm reintroducing Pooki’s Mahi private label products platform under Komo Kitty℠ Collection. Komo Kitty℠ is a collection of services, designs, processes, and technologies and products like Matcha Matcha Man® tea capsules and Kafpresso™ coffee capsules to design, and launch private label products. Silicon Valley food and beverage brand Pooki’s Mahi® announced today Founder/CEO Leslie Magsalay-Zeller landed several food service customers for Pooki’s Mahi® Komo Kitty℠ services to design, launch and fulfill orders for custom Kafpresso™ luxe coffee capsules, Matcha Matcha Man® tea capsules, and 100% Kona coffee pods. “Pooki’s Mahi will handle fulfillment for customers looking for corporate gifts, company swag or custom gifts. Pooki’s Mahi will own fulfilling orders from VIP resellers for private label Matcha Matcha Man® tea capsules or Kafpresso™ coffee capsules intended for retail use. Pooki’s Mahi is my passion project. I designed and launched Pooki’s Mahi brands like Komo Kitty℠, MeowHattan™ Project, Kafpresso™, Matcha Matcha Man®, Kona KaKao™, and Koffee KaKao™. Pooki’s Mahi brand IP portfolio is a reflection of me,” explains the Silicon Valley technology executive. Pooki’s Mahi is reintroducing Matcha Matcha Man® Kafpresso™ tea capsules on authorized resellers marketplace platforms. The shot list includes national food grocery retailer with 5000+ locations in 25+ states, international marketplaces with 10000+ stores worldwide, Silicon Valley-based technology corporate kitchens, and on PookisMahi.com. Matcha Matcha Man Kafpresso tea capsules will have UPC #812283020763. Majority of Pooki’s Mahi® Matcha Matcha Man® Kafpresso™ products will not be available on Amazon. Pooki’s Mahi Founder/CEO redesigned packaging for Matcha Matcha Man® 812283020763 tea capsules. Packaging for Kafpresso™ capsules has CA Prop 65 product label requirements for coffee products, ingredients, source, nutrition information, best used by date, lot date code, UPC and RFID designator. Packaging for Matcha Matcha Man Kafpresso™ tea capsules will list the ingredients family, nutrition information, best used by date, lot date code, and UPC designed onto the packaging. Pooki’s Mahi product name, brand line, SKU and UPC are located on the spine. If available, product certifications can be found on the spine of the new packaging. Pooki’s Mahi new packaging design integrates brand’s colors and storyboards designed by Founder/CEO Leslie Magsalay-Zeller. The improved packaging designs have the brand symbol, the name of the single serve coffee maker Kafpresso™ capsules are compatible with, and information on becoming a VIP customer inside each product box. The compact packaging enables Pooki’s Mahi to offer complimentary two-day shipping without requiring a membership fee. Pooki’s Mahi supply chain hub is in California. Pooki’s Mahi consolidated operations and moved all supply chain management to the West Coast. Pooki’s Mahi Founder/CEO reviewed 1000+ firms and selected FDA certified manufacturing facilities. Catalog for Matcha Matcha Man tea capsules initially contained up to 30 different flavors across several varieties. Pooki’s Mahi uses higher quality tea ingredients to create unique, flavorful combinations. Matcha Matcha Man Kafpresso Herbal collection are naturally caffeine-free. Herbal drinkers preferring a citrus drink can drink flavor combinations for hibiscus, peach, lemon, lemon myrtle, lemon grass, lemon verbena, lime essence, creamy coconuts, and orange peel. Pooki’s Mahi uses rooibos tea to create flavor profiles with ginger, honey busy, lemon verbena, fruity raspberry, zesty lemongrass, hibiscus, mint, and black currant flavors. Custom tea drinkers will have several options. Founder/CEO Leslie Magsalay-Zeller designed Matcha Matcha Man® Kafpresso™ tea capsules to expand the existing Matcha Matcha Man® tea product line directly to consumers. Pooki’s Mahi® mascot for Matcha Matcha Man® Kafpresso™ tea capsules is a rare turtle named, Honu, who is determined to succeed against all the odds. Designs for Matcha Matcha Man® Kafpresso tea capsules were inspired by Founder/CEO Leslie Magsalay-Zeller time at Fortune 500 cloud computing and SaaS companies leading launch teams. Product teams completed brand designs after finishing a lengthy pilot to test market fit for the products. The Silicon Valley technology executive used a similar approach to test Koffee Kakao, and Kafpresso storyboards, messaging, personality and brand pitch with existing customers. Pooki’s Mahi existing brand advocates repeat customers and celebrities influenced the design priorities. Matcha Matcha Man® tea capsules are currently sold in Pooki’s Mahi® Komo Kitty℠ collection of products and services for private label products customers. 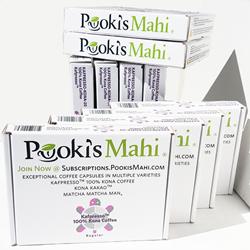 Private label customers consider Pooki’s Mahi Matcha Matcha Man® tea capsules as a luxury custom tea beverage. Matcha Matcha Man tea capsules create a soothing drink infused with fruit. No artificial flavoring. Matcha Matcha Man® tea pods first launched in 2012. Pooki’s Mahi transitioned Matcha Matcha Man® tea capsules to Pooki’s Mahi Komo Kitty℠ collection of services to develop custom tea products for private label products. High minimum order requirements for Komo Kitty℠ services including Matcha Matcha Man® tea capsules. Pooki’s Mahi Founder/CEO Leslie Magsalay-Zeller is planning on expanding Matcha Matcha Man flavorful tea capsules with several proprietary flavors and blends throughout 2019 to non-private label customers. The Silicon Valley executive has not confirmed the official launch date. Pooki’s Mahi team of nutritionists, tea sommelier, and Founder/CEO Leslie Magsalay-Zeller worked on reformulating flavors for Matcha Matcha Man tea capsules product line in 2017. The first loose leaf Matcha Matcha Man teas will be available in a tea capsule form. Pooki’s Mahi uses certified single origin tea sourced, blended through direct trade relationships. No artificial flavorings. Matcha Matcha Man tea capsules will not have powdered green tea known as Matcha tea. Matcha Matcha Man tea capsules will be the second set of Kafpresso™ capsules manufactured in the new FDA certified facility. An expanded catalog of Matcha Matcha Man® tea capsules are available in Pooki’s Mahi® Komo Kitty℠ collection. Komo Kitty℠ is a collection of services and private label products looking for custom tea capsules as corporate gifts or celebrity swag. Komo Kitty℠ is also for customers looking to design and sell their own private label tea pods and can provide a registered UPC certificate. Pooki’s Mahi Founder/CEO Leslie Magsalay-Zeller is the Creative Director for Pooki’s Mahi Komo Kitty℠ collection. The Silicon Valley technology executive designs and launches private label products for the client’s next product launch event. Other customers include but not limited to professional sports teams or food service customers looking to expand their existing beverage catalog. Recyclable Matcha Matcha Man® tea capsules #812283020763 made from single-origin or micro-lot tea ingredients sourced through direct trade relationships. Matcha Matcha Man® Kafpresso™ tea capsules for use in Original Line Nespresso coffee brewers. (20) Matcha Matcha Man® Kafpresso™ tea capsules in each ship-ready package. Nutrition information, ingredients, and tea capsule information visible on each package. Complimentary product samples are not available. Matcha Matcha Man® Kafpresso™ capsules available as a subscription or one-time purchase. VIP reseller, distributor or reseller pricing for Pooki’s Mahi Komo Kitty services. Pooki’s Mahi owns fulfillment for customer orders received from food service retailers. Complimentary two-day shipping to all of the USA including Alaska, and Hawaii. Pooki’s Mahi is testing shipping times for standard and two-day shipments to USA territories. No returns on food or beverage products. The Silicon Valley-based food and beverage brand have grown without a loan or venture funding. Pooki’s Mahi Founder/CEO takes a high tech approach to develop and launch new products. The technology executive continues to build and improve architecture to support existing ecommerce platforms. Leslie Magsalay-Zeller designs introduce Pooki’s Mahi® product lines and continues to update technology platforms supporting multiple channels. The Silicon Valley startup is focused on manufacturing expensive 100% single origin specialty coffee under its Kona KaKao™, Kafpresso, and Kona Kafpresso brands; as well as Matcha Matcha Man® tea pods. Kona coffee, 100% Kona KaKao™ coffee for Keurig 1.0 and 2.0 single serve coffee makers. Pooki's Mahi®, Matcha Matcha Man® has registered trademarks of Pooki’s Mahi. Komo Kitty℠, The PMO Practice™, Kona KaKao™, Koffee KaKao™, Kona Kafpresso™, and Kafpresso™ are trademarks of Pooki’s Mahi. New Product Launch Introductions, Go To Market Planning, and supply chain frameworks are protected under VA 1-924-170. Pooki’s Mahi® is a Silicon Valley-based technology company passionate about combining technology, operations, and digital marketing to consistently launch the best Kona coffee pods, new private label coffee capsules and custom tea capsules to market. Pooki’s Mahi was launched by Silicon Valley technology executive Founder/CEO Leslie Magsalay-Zeller. Pooki’s Mahi owns the supply chain, sourcing the raw materials and global distribution channels. Pooki’s Mahi’s mission is to change current supply chains into a just-in-time (JIT) model by using technology and processes to launch specialty coffees or teas into the market in a sustainable, or recyclable capsule. Certificate of Insurance is required to resell Pooki’s Mahi 100% Kona coffee pods, or Matcha Matcha Man tea capsules. Customers partner with Pooki’s Mahi for the efficient supply chain, go to market launch and new product introduction expertise. Global retailers, professional sports teams, luxury hotel chains, and corporate kitchens sell Pooki’s Mahi®. Pooki’s Mahi performance-driven executive team are recognized with 150+ protected IP, 100+ exits, and 50+ awards in technology, operations, and supply chain including Hall of Fame inductions. Pooki’s Mahi Kona coffee capsules, Matcha Matcha Man® tea capsules, Kafpresso™ coffee has been a favorite of customers, charities, celebrities and athletes and have been featured at red carpet events including Celebrity Gift Suites, award shows, and seen on several television shows.